The first in a series of cutting edge corporate training courses in powerful 3D design and visualisation software has just been completed at the University of Hull. The course is an introduction to Autodesk's 3ds max - now an industry-standard for businesses ranging from architectural visualisation, to web development, broadcast, and film - that takes complete beginners to the point where they can embark on their own 3D projects. The course is a collaboration between training providers Zabanda media Ltd and the Hull Immersive Visualisation Environment (HIVE), based in the Department of Computer Science at the University of Hull. Following this initial success, future courses are planned that will give attendees the same unique opportunity to use the high-powered 3D graphics workstations and 3D stereo facilities of the HIVE. James Cherry of Eon Media (pictured receiving his certificate) said "Since completing the course, I immediately put 3ds max into use in the workplace and created several models for regular clients. I thoroughly enjoyed the course from beginning to end. It was highly informative and I feel that I have learnt a substantial amount. I am looking forward to putting everything into practice and developing my skills, perhaps by attending the intermediate course at a later date." Mark Faulkner, Managing Director of zabanda media, said "I am delighted that our first course was a success. Utilising four full days for training allows attendees to be introduced not only to the basics, but also to a variety of more exciting elements such as creating photo-real interior scenes and product models. The HIVE facilities are unique to the region and provide trainees with a real edge." 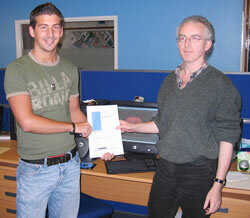 The course is supported by the New Technology Institute, based at the University of Hull. The Institute provided a 50% grant towards the cost of training, as part of its involvement in the Digital Industries skills broker programme, run through the Learning and Skills Coucil and Yorkshire Forward. Gill Cutting, Broker Manager at the NTI said "The skills brokerage had identified through its work with local employers, a growing need for this type of training in the Humber sub-region. We were only too was happy to promote and support this initiative."